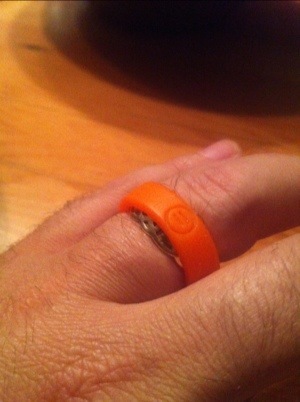 Wearing an orange equality ring over my wedding ring. In Minnesota last week these were being handed out to people who wanted to show support for marriage equality. There is an initiative on the November ballot that would add an amendment to the state Constitution that declares that only men and women can be married. I’m wearing this orange ring over my own wedding ring in solidarity with those who want marriage to be fully legal in Minnesota. I cannot understand how a country that prides itself on equality can even dare contemplate denying equal rights to a group if people. I hope voters in Minnesota reject the amendment in November. And I hope that following that, the institution of marriage will be made fully legal in the state.